The product will be an interactive website that provides a platform for private collections, including the collections of a sample of small to medium-sized collectors: ‘Temporary Custodians of Islington Mill’, namely a collectively-owned artwork created by Carlin and currently held by 80 individuals, primarily located across the North West (NW). The website will host an innovative and accessible participatory public database of artworks, forming an important new cultural resource for the region. This project aims to disrupt the current art market and collecting system, which limits notions of success for artists, concentrates wealth and opportunity in large urban international centres such as London and excludes all but the wealthiest tiers of society. This project will prototype an alternative collaborative model, by bringing together the burgeoning collector community in the NW. Helen Kaplinsky is a curator and co-founder of Res. (London), a collaboratively programmed gallery and workspace that supports emerging creative freelancers including artists, curators and writers. Specialising in collection and archive based projects, the thematics and strategies of her curatorial projects consider property in the age of digital sharing. Origens Media Lab is a research laboratory conceived as an interdisciplinary third place in the humanities and social sciences. Founded in 2010 by Emilie Ramillien and Diego Landivar, Origens has been conceived as a space to overcome institutional constraints weighing on conventional research institutions. Origens proposes to investigate what is at stake behind the ecological crisis that we are going through, not as a purely technical challenge, but as a true anthropological mutation that continues to redistribute the various societal and natural arrangements. 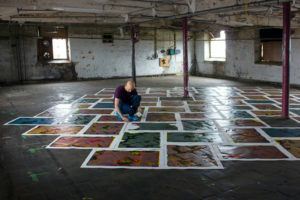 I’m an independent curator and I’ve been collaborating with Salford based artist Maurice Carlin for nearly ten years! We both have a strong interest in ownership, sharing, responsibility and ultimately how to give artists a bigger stake in the value they create. Temporary Custodians 2018-2018 is an artwork by Maurice that is the shared responsibility of 100 custodians over 10 years. The idea is to publicly declare this ‘custodianship’ and extend the conversation to other collectors- like a distributed museum without walls. Maurice is based at Islington Mill studios in Salford and the OpenMaker scheme has already provided some amazing opportunities for creative practitioners in this community. It seemed like a really natural fit for us to apply when the next round was announced! What are the main strengths and challenges of maker-manufacturer partnership? Over the last 5 years at times I have felt demoralised, like I will never find ‘the one’ (!) right collaborator in the tech industry. I’ve attended loads of conferences, workshops, panel discussions and been set up on dates with people in the industry in a bid to find those with shared ethics. In the end I just had to accept that it takes time! I now feel like I have a really strong network and understanding in the field of arts and technology from these years of research. I am now part of an ongoing research group formed around arts and tech. This has developed over the last 2 years, it was a case of recognising the need for this and making it happen together- a space for sharing references, comparing ethics etc. It was through this research group that I met our collaborators- Director of Origens Media Lab Alexandre Monnin and Sociologist Manuel Boutet. They have a very nuisanced approach to web design informed by social science and philosophy. Dream big! What's the main challenge that stands on your way? The main challenge that stands in my way, is an ability to remaining open to change. Remaining open during project development can enable something to change beyond recognition, which I find really exciting. Staying too attached to a singular vision can be disruptive to a project’s success, so I think a massive achievement would be if the project ended up having some outcomes that were totally beyond mine and Maurice’s initial vision. I have many interlinking research projects and the OpenMaker experience would enable me to work in a really focussed way on the needs of a specific artistic project in relation to the wider ecologies of the artworld. I see this as a really important blue print to begin a wider conversation and test this model with other creative producers, even taking it beyond the visual arts to other fields such as activism and theatre.